Each autumn, my tiny mountain community celebrates the transition from summer to winter with abandon. Perhaps here at the very end of the road where our little town sits nestled between the undulating folds of the Rocky Mountains, we live a little less removed from nature. Those thin transitions between summer and autumn, autumn and winter seem a little more pronounced here where the people still depend on the seasons. As we brace ourselves for winter and what will amount to another nine months of snow, an odd sense of both dread and excitement pervade the sleepy community. Yes, winter brings snow, skiing, snowshoeing and much-needed income from tourism, but it also brings an odd, but intense sense of isolation. In good winters, piles of snow can reach rooftops, access in and out of town can be limited days. Here, you must take a deep breath and brace yourself for winter. So, as summer fades, the air takes a decided crisp chill, and the aspens and cottonwoods exchange their green for gold, the people of our tiny mountain take a collective breath together – uniting for a week-long celebration that allows us to rid ourselves of any lingering negativity from the past year as we come together to embrace a new seasonal cycle and prepare for what will be another long, cold and bitter winter. 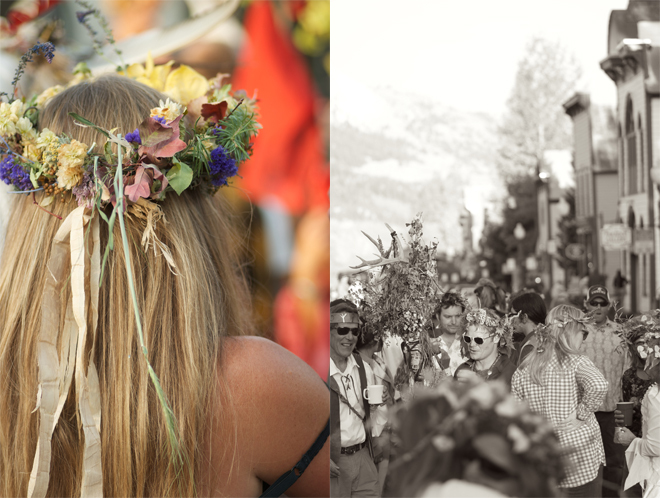 It’s celebration of nature, fire and fertility – beginning first with a dance to honor the Harvest Mother (who is, typically, the most visibly pregnant mother in town) complete with stiltwalkers, belly dancers and song. From there, the energy of the community grows ever more intense with evening storytelling, liar’s contests and the crowning of the Green Man – a man who is a decided lover of women and who consistently gives of himself to the betterment of those around him. During this time of waning light, we venture into the woods with friends – gathering willows, plumes of golden aspens leaves and the last of the wildflowers with which we’ll make our crowning wreaths. We breathe the fresh air, we listen to stories and song and we dance in the streets with ecstatic abandon. Men kiss maidens, women kiss the green man and we all commit to support one another for another intense and grueling year. It’s a time of color, love and feasting. 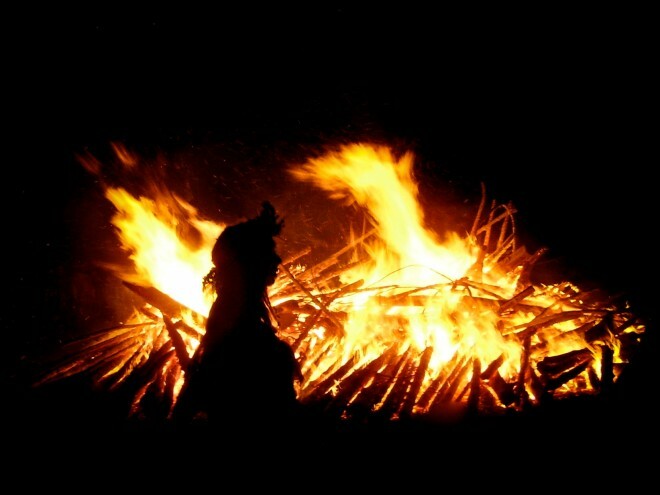 Finally, after a week of community storytelling, fire dance, harvesting and feasting, we end the celebration with mumming, street plays and community bonfire in the center of town that can reach four stories tall. As I watch the fire, my little boy snuggled in my lap, I see a beautiful oneness as the flames lick the dark of the autumnal sky. They reach up, releasing our collective woes, and as the flame flickers and rises up there is a brief moment when its bright embers embed themselves into the night and become indistinguishable from the stars. For our part, my husband and I give to our community through food – through real food. Through our work in our farmers market, we host and organize the community’s annual harvest feast which typically feeds 300 people in what is Colorado’s largest farm-to-table dinner. The dinner also benefits area not-for-profits and is priced very affordably, showing that real food is not elitest, or expensive, and with good work and devotion you can nourish an entire community. For me, the week starts early – gathering food (over 800 lbs), working with restaurants who generously close so that we can use their licensed kitchens. 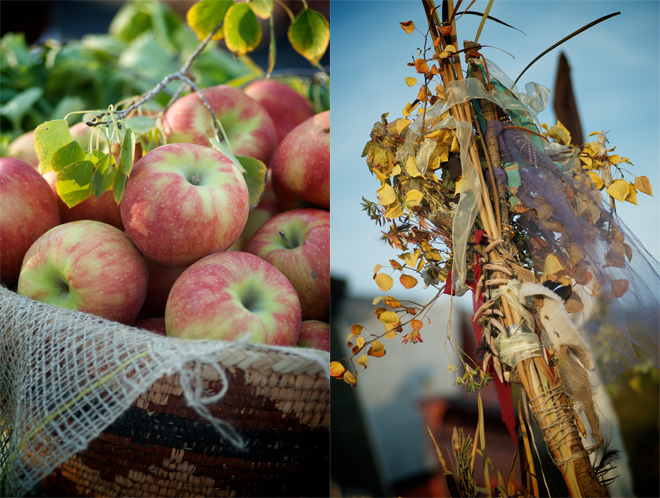 In the end, we serve a huge meal – roasted meats, roasted root vegetables with herbs, whole-grain sourdough bread, fresh autumn fruit, hard cider, traditional mead and cider-braised cabbage and apples. It’s exhausting and wonderful at the same time (and it also explains why I hardly post or answer emails in September). We line the street with tables, candles, luminaries and fire cauldrons, and serve the meal on the main street in town, under the dark of night and beneath the twinkling of the milky way’s stars. Later, as we clear away the tables and any leftover food (which feeds local pasture-raised pigs), the cauldrons are lit and the poets and fire dancers venture out to entertain the community. And though you may not be able to join our community in song and dance and fiery celebration, you can make this dish (my favorite) in your own kitchen and feel a bit of the same feasting celebration of summer turned autumn. 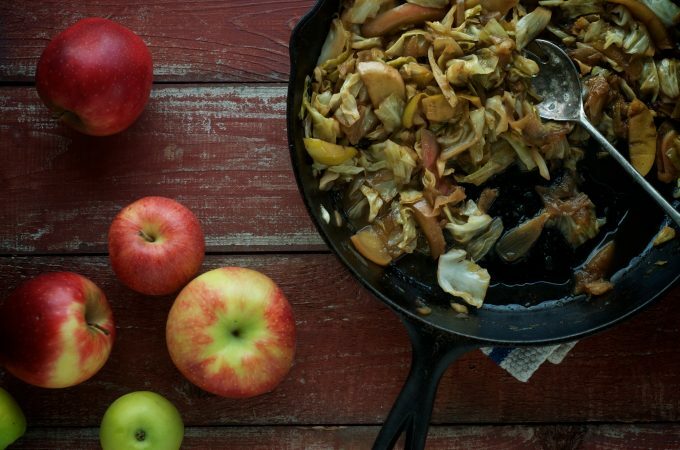 I typically serve Cider-braised Cabbage and Apples in the autumn and winter when these foods are available in abundance. I often pair the dish with broiled sausage and roasted root vegetables with fresh herbs. This recipe calls for ghee (clarified butter popular in Indian cooking, that is available here, though you can substitute pasture-raised lard (available here). Melt the ghee in a large (12-inch) skillet over moderately high heat, then toss in sliced onion. Fry until translucent and a bit caramelized at the edges, 6 to 8 minutes. Stir in apples and fry until fragrant, a further 2 to 3 minutes. Reduce heat to medium, toss in chopped cabbage, stir well to bring the apples and onions to the surface, and cook for about 5 minutes. 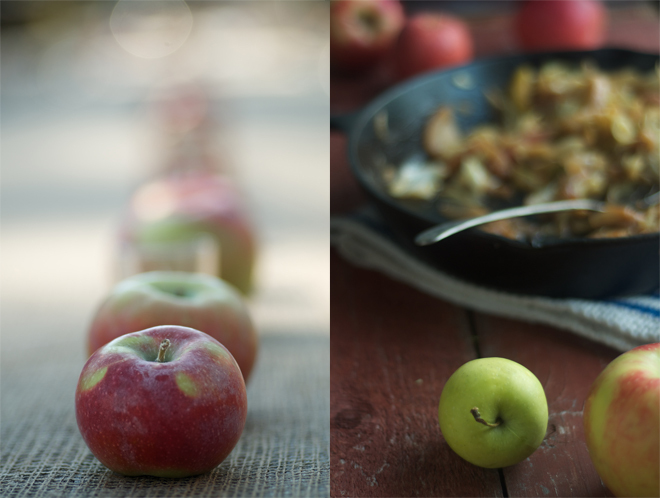 Pour cider into the cabbage and apples, and toss in the bay leaf. Simmer, uncovered, for 30 to 35 minutes or until the cabbage and apples are soften and the liquid is largely evaporated. Sprinkle the dish with sea salt and stir in the apple cider vinegar. Continue cooking over medium heat for a further 2 to 3 minutes, then serve. I loved, loved, LOVED this post! Earthy and sweet. Thank you. I just wanted to say your celebration sounds absolutely wonderful. I am a little green with envy truth be told! I always enjoy your posts, and this one propels me to comment but please keep up the good work after you recover. Me too, Lindy! At first I thought this must in the UK, and I was thinking “hey, but I thought she was in the US!” Yes! Great Article and photos! Thank you so much for sharing a little Vinotok with me! My favorite festival of all time! 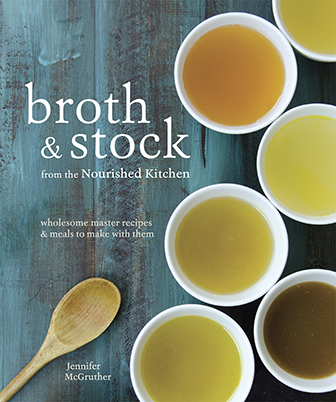 Thank you too for all the awesome recipes and ideas that you inspire. I love this recipe! I have trouble finding organic apple cider. Since apples can be heavily sprayed, I don’t want to take my chances on it. Do you think organic apple juice would sub for the apple cider okay? Thanks for your lovely posts and recipes. This recipe sounds wonderful, and I’ll make it tonight! Your post was very heart-warming and enriching. Thanks so much! Great post. I would love to visit your community during this festival. It seems like an amazing experience. What an awesome celebration! I didn’t know festivals like that existed anymore. What a cool transport to an older, but wonderful place in history when community meant so much. What a lovely post,in some ways I am envious of such wonderful celebrations,(but not of 9 months snow! ), I live in Australia, on the South coast of south Australia, we are just going into Spring, from a long and cool winter with lots of rain, I am a founder of our own farmers market, and would love to implement this farm to table dinner, although the community is not what you would call united! I’m just pulling the last few cabbages from my own garden and will try this recipe tonight, then use the rest of my cabbages for a large batch of cultured vegies, I have a stall at our farmers market I make french charcuteie, and other artisan products, I also run a cooking school from time to time, i”m just introducing a new small range of grain free products, out of all the sites to which I subscribe, I love this site best, keep up the good work. Lyn, I am also in Australia- living in sub-tropic Brisbane. One of my dreams has been to visit around our wonderful land, especially networking with real food, sustainable living folks! With my health and strength returning, this is so close to happening! I’d love to be able to catch up with you and your farmers markets some time soon! Any way we can get together? I have some organic Chinese cabbage from our Moggill Markets and am off to source sweet apple cider… let you know how it turns out! My husband And I have been on a cabbage kick lately. This dish sounds so good and sweet, never thought of adding apples to cabbage. I must give this a try. Thanks! Where IS this magical place?! It sounds so magical! What a wonderful celebration! I live in Florida where, despite what the calendar says, it is still summer. I long for such a meaningful celebration of the seasons. Thanks so much for the inspiration! Crested bueute is such a beautiful place and I have missed several years of the festival but it is so much fun!! The recipe sounds wonderful and can’t wait to try it!! This is a truly beautiful post. You can almost smell the cider and smoke! Really wonderful, thanks for sharing! Loved this post and the beautiful celebration pictures. I’ll cook this to serve with tonight’s dinner. I’m from west of Sydney, Australia and love your website. 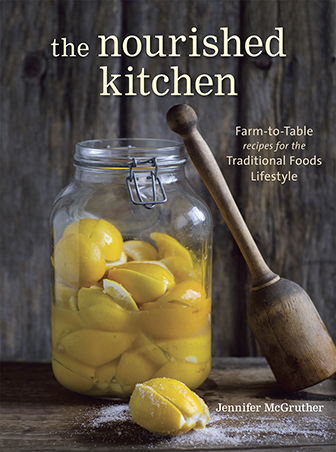 I cook from it all the time and recommend it to a lot of people. Looks like a great celebration. I worked at a King Supers store in Denver in 1970 as a teenager and really liked your state. I wish I lived there because I would like to visit your autumn feast. Plus, your state is a medical cannabis state and God’s medicine is more holistic than the synthetic poisons from the big pharmacy corporations. Obviously I’m not the only one jealous of your lovely festival. I’m jealous! Totally jealous!!! This recipe is perfect for our Samhain festival, I think I will make it. And your photos are GORGEOUS! I absolutely loved this beautiful post! It makes me want to move from sunny Southern California to the mountain lands! These kinds of posts are my favorites out of all the ones you do, Jenny. And I love pretty much everything you do, lol! I wish I could be there in your nature-loving, season-celebrating, real food-eating, company. Gorgeous pictures too, especially the pregnant belly woman, and the colorful masks. I made this for our weekly potluck here at Cricket Creek Farm in Williamstown, MA with apples from our land, cider and cabbage from our neighbor, and I used lard from our animals instead of ghee because that is what I had on hand. Thank you for sharing. This dish was delicious. Wow. This is the kind of community and connectedness to nature that we are so lacking in this day and age. I long for this kind of life. I hope your community never changes and I hope there are many more tiny mountain communities just like yours unbeknownst to most of us. This recipe looks so good! We’ll definitely be making this soon. This is a totally offensive blog. Why are you posting about satanic pagan rituals? There is nothing offensive about this post. This is how our country, and our ancestors countries (i.e. the U.K) celebrated. I LOVE that there are some communities still celebrating in the TRADITIONAL ways. After all, we want to maintain tradition, right? I am making this recipe this week- I love cabbage and am always looking for new recipes to try! This makes me so homesick for Germany! 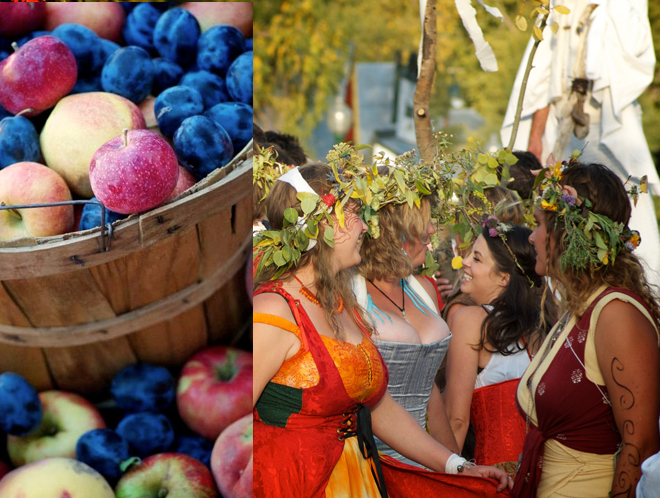 The harvest fest sounds magical. I can’t wait to try this recipe and share it with friends and family! So beautifully told! 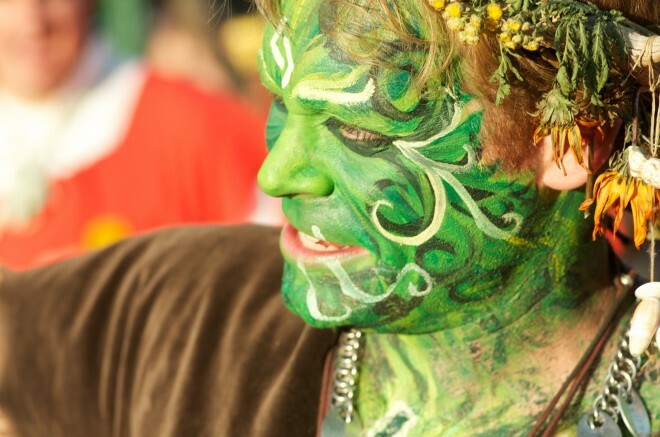 I want to come and kiss the green man and dance by the fire! I can not wait to try this recipe! Thanks! Your writing is so lovely! What a magical celebration & in the US, no less! 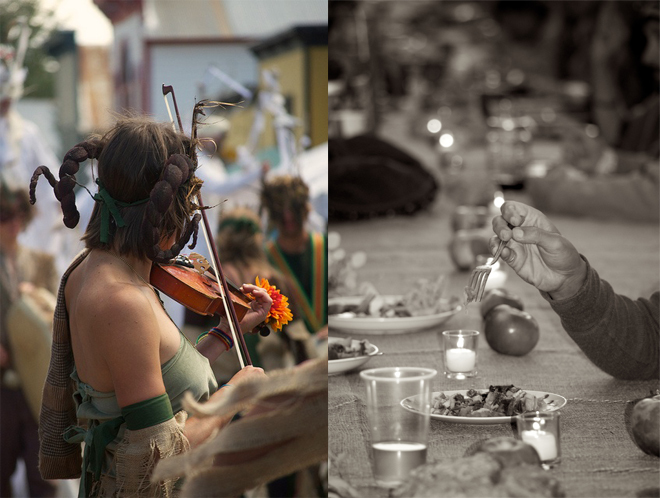 Elated to see that the connection with seasonal rhythms–fasting & feasting (! )–is still strong in some American communities. We make this every year at Thanksgiving. I use red cabbage because it’s a family holiday tradition that I try to keep alive. It’s truly delicious!